The somatic nervous system (SONS), also known as voluntary nervous system, is a part of PNS and is involved in controlling the voluntary muscular movements of the body. It controls the skeletal muscles in the body according to the stimuli obtained from the sensory receptors of the body. On that account, the somatic nervous system is composed of both afferent and efferent nerves. The afferent neurons are responsible for carrying information from sensory receptors to the central nervous system. The efferent neurons are responsible for carrying information from the central nervous system to the effector organs. The afferent and efferent neurons are connected by interneurons at the central nervous system. The somatic nervous system is composed of two parts: cranial nerves and spinal nerves. The cranial nerves carry nerve impulses in and out of the brain. The spinal nerves carry nerve impulses in and out of the spinal cord. In addition to controlling voluntary muscular movements, the somatic nervous system is also involved in controlling involuntary muscular movements called reflex arcs. In reflex arcs, the skeletal muscles work without coordinating with the central nervous system. The nerve pathways of the reflex arcs are connected to the spinal cord. There are two types of reflex arcs: autonomic reflex arcs and somatic reflex arcs. The autonomic reflex arcs control the involuntary actions of organs while somatic reflex arcs control that of skeletal muscles. 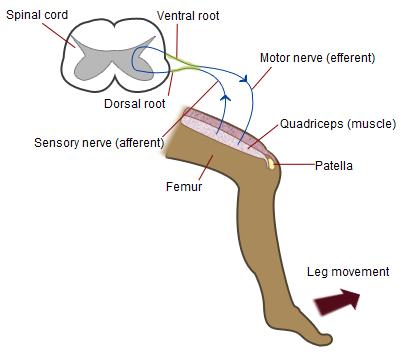 The knee reflex is shown in figure 1. The autonomic nervous system (ANS) is another part of PNS, controlling the involuntary muscular movements of the body. The autonomic nervous system controls the muscular movements of the heart and other smooth muscle movements in the stomach, intestine, liver, kidney, lungs, and blood vessels as well as the glands such as sweat, salivary, and digestive glands. Thus, the autonomic nervous system controls the blood pressure, heart beat, digestion, metabolism, body temperature, urination, and homeostasis. 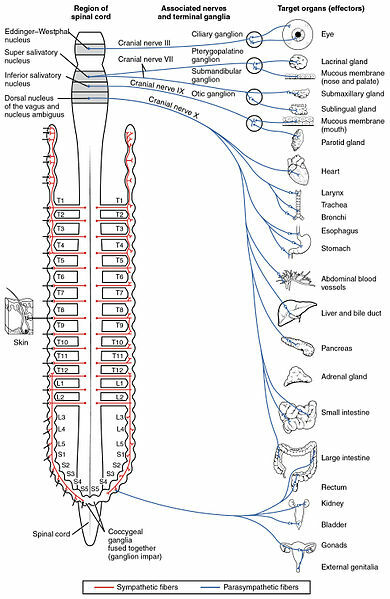 The innervation of the autonomic nervous system is shown in figure 2. The two components of the autonomic nervous system are sympathetic nervous system and parasympathetic nervous system. Sympathetic and parasympathetic nervous systems have opposite effects on the above-mentioned processes. The sympathetic nervous system prepares the body for fight-or-flight response under stressful conditions. Thus, the heart rate is increased, airways are dilated, and the energy-demanding processes such as digestion and urination are stopped. The parasympathetic nervous system maintains the body at rest. It decreases the blood pressure and heart rate while inducing the secretion, digestion, and urination. Both somatic and autonomic nervous systems are two components of the peripheral nervous system. Both somatic and autonomic nervous systems are involved in controlling muscular movements of the body. Autonomic Nervous System: The autonomic nervous system is the part of the nervous system which regulates the involuntary movements in the body. Somatic Nervous System: This is also known as the voluntary nervous system. Autonomic Nervous System: This is also known as the involuntary nervous system. Somatic Nervous System: This innervates the voluntary skeletal muscles. Autonomic Nervous System: This innervates involuntary smooth muscles, cardiac muscles, and glands. Somatic Nervous System: Smell, noise, taste, light, touch, pain, and temperature are the sensory stimuli detected by the somatic nervous system. Autonomic Nervous System: The blood pressure, salinity, and pH are the sensory stimuli detected by the autonomic nervous system. Somatic Nervous System: The somatic nervous system always causes the excitatory response at the effector. Autonomic Nervous System: The autonomic nervous system may cause either excitatory or inhibitory response at the effector. Somatic Nervous System: The somatic nervous system releases acetylcholine at the effector. Autonomic Nervous System: The autonomic nervous system releases acetylcholine or norepinephrine at the effector. Somatic Nervous System: The somatic nervous system is composed of a single neuron between the CNS and the effector organ. Autonomic Nervous System: The autonomic nervous system is composed of two neurons with a single synapse between the CNS and the effector organ. Somatic Nervous System: This is composed of thick myelinated nerve fibers. Autonomic Nervous System: This is composed of both thin and thick myelinated nerve fibers. Somatic Nervous System: Spinal and cranial nerves are the two branches of the somatic nervous system. Autonomic Nervous System: Sympathetic and parasympathetic nerves are the two branches of the autonomic nervous system. Somatic Nervous System: Posture and movement are the functions of the somatic nervous system. Autonomic Nervous System: Visceral functions such as secretion and control of metabolism are the functions of the autonomic nervous system. Somatic and autonomic nervous systems are two components of the peripheral nervous system of the body. Both nervous systems are involved in controlling the functions of the body based on the internal and external stimuli. The somatic nervous system is composed of spinal and cranial nerves. The autonomic nervous system is composed of sympathetic and parasympathetic nervous systems. The somatic nervous system controls the voluntary muscular movements and the reflex arcs. The autonomic nervous system controls the involuntary movements of the body. Thus, the main difference between somatic and autonomic nervous systems is the type of movements controlled by each of them. 1.” Somatic Nervous System: Definition, Function & Example.” Study.com. N.p., n.d. Web. Available here. 03 July 2017. 2. Kendra Cherry. “What Is the Somatic Nervous System?” Verywell. N.p., n.d. Web. Available here. 03 July 2017. 3. “Overview of the Autonomic Nervous System – Brain, Spinal Cord, and Nerve Disorders.” MSD Manual Consumer Version. N.p., n.d. Web. Available here. 04 July 2017.